Brownie is a medium brown bear with a lighter brown muzzle and black button eyes. Brownie the Bear was introduced on 16th June 1993 but was quickly retired due to his name being a spelling mistake. 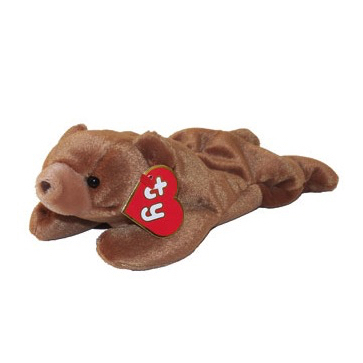 He was re-introduced under the name Cubbie, making the bears with the original “Brownie” tag one of the most rare and valuable Beanie Babies available, with those being sold fetching a high price. Because the original Brownie was only released with 1st generation swing and tush tags, he does not have a birthday or a poem.